There are times when you just want a little snack. Nothing heavy or filling, but something with good flavor. Appetizer tend to be so heavy and fattening; which is why I really like this option. This appetizer is so simple, light and tasty you'll love it and it won't ruin your dinner! 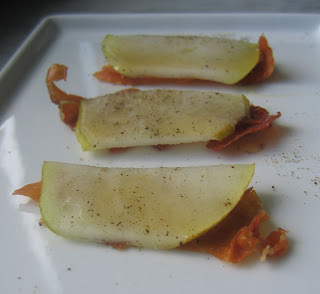 I'm already thinking of variations on this as well- like strips of an aged cheese in place if the pear. 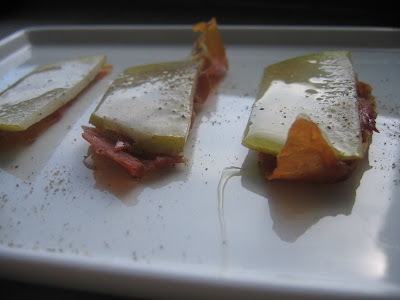 Perhaps thin slices of cantaloupe (as a play on the classic cantaloupe slice with cold prosciutto draped over it.) Or maybe apple with a hint of peanut butter! Mmmh! I'll play around with those options, and if you come up with variation on this - do let me know! These could be easy to take with you to a party - just pre-bake the prosciutto, then a cut your pear when you arrive at the party and assemble. Call me crazy- but I can even see these as a dessert or accompanying a dessert too! These will disappear in seconds and everyone will still have room for dinner- nothing left to do but be fat and happy! Cut the prosciutto into either rounds or strips (say 2" by 4"). Place a foiled baking sheet and bake until crispy. (I used 400 degrees for about 8 minutes.) Remove from oven. Layer with a strip of pear. Drizzle with honey and fresh ground pepper.